It is widely accepted that Apple is going to launch new iGadgets next week but one blogger thinks we could also see a surprise software announcement. 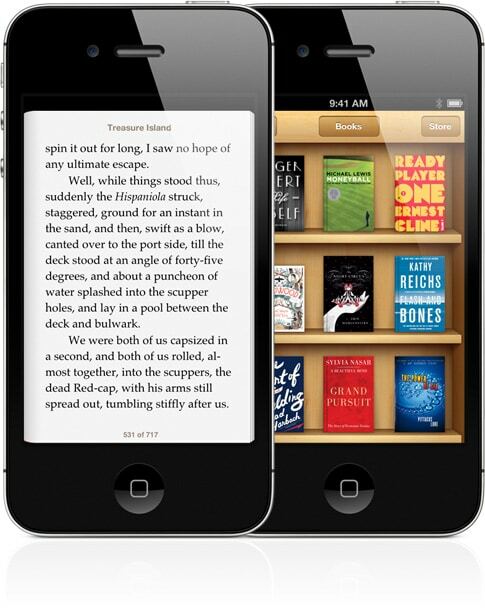 A blogger with Macworld thinks that the iPhone could gain new support for ebooks made by iBooks Author. This is of course completely separate from the new iBooks app for OSX, and if this prediction is true then the iPhone could become a lot more useful in the classroom. Apple announced iBooks Author in January 2012, and ever since then you have only been able to use the app to produce ebooks for the iPad. It's not clear whether the limitation is technical or by design, but iBooks Author can't make an ebook which can be read on an iPhone. To view this book, you must have an iOS device with iBooks 3.0 or later and iOS 5.1 or later, or a Mac with iBooks 1.0 or later and OS X 10.9 or later. The thing about this requirement is that it didn't use to say that. Instead it said that you had to read the ebook with "iBooks 3.0 or later on an iPad". That is a telling change, and while it's not always a good idea to read too much into a few words in this case I think Apple may have given away the news. On the other hand, I should also point out that Apple could have announced this new support back in May when they announced that OSX would be getting an iBooks app. They didn't, and that could be a sign that we're reading too much into this. Nevertheless, my gut says that it is probably going to happen. It would make sense for Apple to expand the potential market for ebooks made with iBooks Author to include the more numerous iPhones (and iPod Touch). Of course, if this did happen the change might also require an update to iBooks Author so it could produce ebooks with formatting that made better use of an iPhone's screen real estate. But it is entirely possible that Apple could announce everything all at once. I'm not conversant on the technical details. What do you think? As someone has written in an iBA article I’ve read online, this could easily be done by only supporting the portrait mode in iBA books. That is, in iBA books build to support both portrait and landscape viewing. When build for both orientations, the portrait mode actually becomes fully reflowable with resizable text (and full bleed images, unlike ePub 2). So iBooks on the iPhone could just use this view and automatically boost the font size loads to make it readable. Easily? What about fixed layout? Also, how do we know that the ebooks in question don’t have formatting baked in which assumes the screen geometry of the iPad and or iPad Mini? I’m still looking into this, but it could possibly throw a wrench in the works. The source also makes ebooks for Macworld, so he would likely know if there were technical issues. This sugggestion is just weird. Let’s say I use iBooks Author to make a page with a photo that takes up 1/2 the iPad maxi screen. It will also takes up 1/2 the iPad mini screen, and looks squashed. And now someone is suggesting there is a market for seeing that photo as 1/2 the size of an iPhone screen! Umm, I don’t think so. Though people do write things on the heads of pins etc, so maybe some people will go for it. That’s a problem with how the ebook is made, not with how the app functions, so I don’t think it’s a reasonable objection. But I do agree that if this rumor does come true then it’s going to cause headaches for publishers.